Every year, a few snowy owls winter in the Skagit Flats area near my home in Washington. Last winter, snowy owls were abundant because of low lemming populations farther north. Many of the owls frequented the Skagit Flats, but several chose Whidbey Island as their hunting grounds. 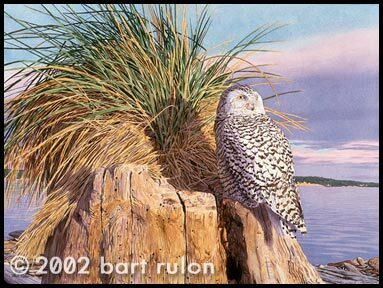 I took advantage of this opportunity by spending countless hours watching and photographing the owls, which frequented the driftwood-covered shoreline of Whidbey Island depicted in my painting. Immature birds, such as the one shown here, are most likely to stray farthest south in winter.